Saudi Arabia: super-rich from vast oil reserves, partnered with America’s imperial agenda, waging terror-war on Syria, Yemen and its own people. Its appalling human rights record doesn’t deter close ties with America, Britain and other EU countries. 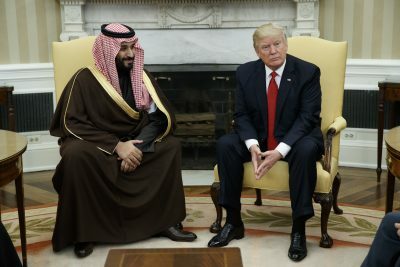 Trump’s visit cashed in big on Saudi wealth, sealing a $110 billion arms deal, signing a memorandum of intent to supply Riyadh with weapons worth around $350 billion over the next decade. They’ll be used for regional wars and domestic repression, its agenda like America’s, waging war on humanity, both countries partnering in high crimes. US and Saudi officials signed a separate memorandum between the Saudi Corporation for the Development of Information Technologies and Apple, other agreements for cooperation in electricity projects, mining and air transportation, the latter deal for Boeing to supply Saudi Arabian Airlines with commercial aircraft. Saudi Aramco agreed to deals worth around $50 billion. Projects were approved for joint investments in US technology, infrastructure and housing, along with Riyadh’s petrochemical industry. Continuation of long-term US/Saudi economic, political and military partnership was affirmed, the latter on the phony pretext of combating terrorism both countries support. All of the above explains why Trump made Saudi Arabia his first foreign visit, officials from about 50 US corporations accompanying him, concluding agreements with dozens of Saudi companies. Claiming both countries intend “charting a renewed path toward a peaceful Middle East” was a bald-faced lie – plans in place for escalated wars, not resolving them diplomatically. “new initiatives will bolster our joint efforts to deter regional threats from Iran in Syria (and) Yemen…” No threats exist. Tehran’s president was noticeably excluded from joining dozens of other Muslim heads of state from Middle East, African and Asian countries, the snub part of wanting Iran isolated, its government toppled. On Sunday, he’ll address Muslim leaders and participate in a Twitter forum. Photo-ops and images will mostly define his entire trip for US and other Western audiences. Saudi Arabia is a family dictatorship, responsible for horrendous civil and human rights abuses. Monarchical rule is despotic, lawless and ruthless, enforced by police state terror. Human rights defenders, political reform activists, and religions other than Sunni Islam aren’t tolerated. So-called Wahhabi Muslims persecute and denigrate Shias, the deplorable way Israel treats Palestinians. Unreported by Western media scoundrels, Saudi forces have been terror-bombing and shelling Awamiya Shias, killing and injuring its own citizens, Trump oblivious or silent about what’s gone on. Nor did he comment on genocidal Saudi war on Yemen, joint US/Riyadh aggression. Washington has close ties to numerous despotic regimes, partners in imperial lawlessness, enriching war-profiteers enormously – the more raging conflicts, the more lucrative arms deals sealed.